A massive spread to several apartments in Valley Cottage. Ida Siegal reports. 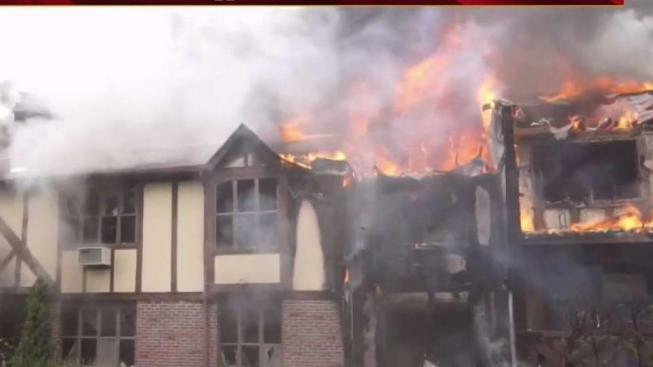 A fire ripped through several apartments in a complex in Rockland County on Sunday afternoon and left one man critically injured, officials said. The fire in Valley Cottage spread through several apartments in the Mountain View condiminum complex on Sierra Lane, fire officials said. Fifteen units were damaged and 10 of the apartments were uninhabitable. One man was taken to Westchester Medical, where he was in critical condition and in a hyperbarrick chamber, officials said. He was expected to survive. An elderly woman had to be rescued from a nearby apartment. She wasn't hurt. The cause is under investigation. It wasn't considered suspicious at this time.